Blog | Water Garden Ltd - Swimming Pond or Swimming Pool? With energy costs ever escalating and ecological sustainability becoming more important to us all, swimming pools are becoming less of an attractive option for those wanting a refreshing dip in their garden. Natural swimming pools are changing the trend and will offer a variety of benefits over traditional pools. It’s fair to say that 95% of the year, a traditional swimming pool remains unused, but still needs to be covered, maintained, closely monitored for chemical imbalances and clarity, not to mention heating. A natural swimming pond might only be used for the same duration but, the pond can look stunning all year round when not in use. 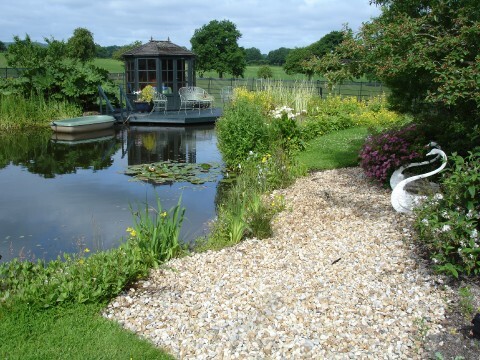 Swim Ponds can be formal or informal in shape and tend to consist of a deeper ‘swim zone’ and a ‘regeneration zone’ for planting, to aid the natural process of breaking down unwanted nutrient. A mechanical filtration system similar to those used in Koi Carp ponds can also be used to help manage the water quality and new developments in technology mean that the filtering is automated and can remove particles from the water (down to 1/3rd the thickness of a human hair) meaning crystal clear, purified water year-round. Swimming pools need to be carefully treated, generally with Chlorine or Bromine which tend to release a noxious smell and can irritate the eyes, skin and in some cases can exacerbate existing respiratory problems. 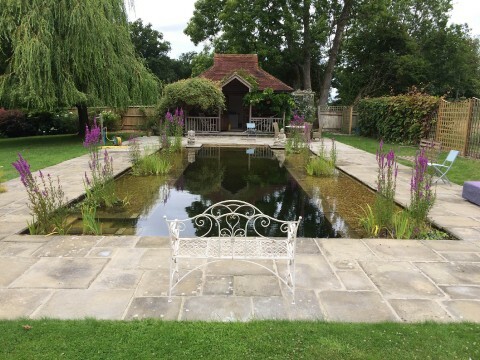 Swimming ponds use no chemicals whatsoever, instead these rely on ‘vegetable filtration’ (planting) and in many cases, mechanical filtering of particles and a UV clarifier to tackle the growth of suspended single-celled algae (green water). This enables you to swim in pure water, similar to a crystal-clear lake swim. Traditional heaters can be used in swimming ponds but as we tend to use pools during those occasional scorching hot summer days, there may not be a need to heat the water at all. Other more innovative methods can be used to raise the water temperature, such as placing the filter system in a well-insulated plant room or summerhouse, using solar water heaters or air source heat pumps which dramatically reduce the costs of heating versus traditional electric heaters. If you have owned a traditional swimming pool before, you’ll be aware of the need to frequently vacuum the pool to remove leaf litter and debris, monitor and adjust chemicals and clarifying agents, backwash filters, cover and uncover the pool to reduce heat loss and litter. Assuming you have the time, this can be a burden rather than a joy. If you employ a professional, costs can mount up over the year. Swim Ponds massively reduce maintenance, particularly when automated filters are installed. Handy tools such as a pond vacuum cleaner can be used to occasionally remove leaf litter and silt from the pond floor. Swimming pools can look wonderful when illuminated and night but they tend to spend most of their time with a thermal blanket or hard cover over them, which is not exactly a treat on the eye. Natural swim ponds are a different story altogether. 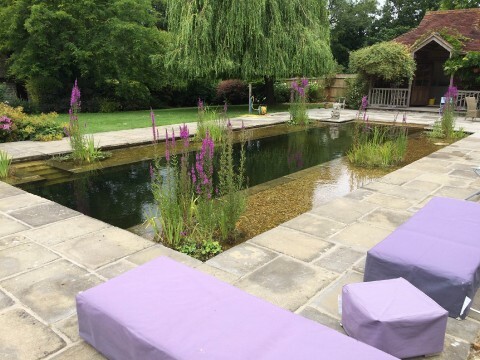 There is no need to cover a swimming pond over when not in use and can look truly stunning all year round, whilst blending seamlessly into the remaining garden landscape. Subtle lighting and water features such as a decorative stream or water cascade can also be added to great visual and audible effect. Swimming pools are certainly not wildlife friendly, due to their heavy reliance on chemicals. Swimming ponds however are wildlife magnets and will act as a haven for a variety of species such as dragonflies, damselflies, bees, newts, birds, hedgehogs, water fowl and native mammals. What’s not to love about that! If you’re considering a swim pond or would like to convert an existing swimming pool, talk to the friendly team of experts at Water Garden Ltd who can guide you through the process.